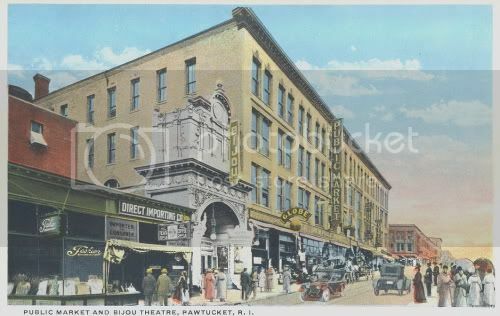 A 1919 Pawtucket city directory lists this theatre. More information would be of interest. The seating capacity was 800 and often had the Standing Room Only sign on display. In 1915, it shared the entertainment duties with four other well known theaters. After its close, New York Lace store took over the lobby and soon spread out into the entire building and adjacent buildings on that block until it vacated the premises in the 50’s. Another city directory lists this theatre, 30 Broad Street, as Keith’s New Theatre. Here is an old postcard showing the Bijou Theatre and the Public Market and other shops on Broad Street, plus pedestrians and cars. A very nice picture of a lost and forgotten theatre!